Incredible Start Page is a free plugin for Google Chrome that lets you customize start page of Google Chrome. You can setup your favorite bookmarks, open the recently closed tabs, and even add a small note! I am a big fan of Google Chrome, and consider it one of the best browser out there. One of the things I really love about Google Chrome is its start page – it quickly shows my most visited pages on the home page, so that I can open them by one click. Incredible Start Page takes that feature to next level. Now, you can control exactly how your start page looks, and what all it shows. Incredible Start Page lets you customize background color of your Google Chrome start page. It also lets you add image as background from Flickr images. You can configure which websites show up on your start page of Google Chrome. 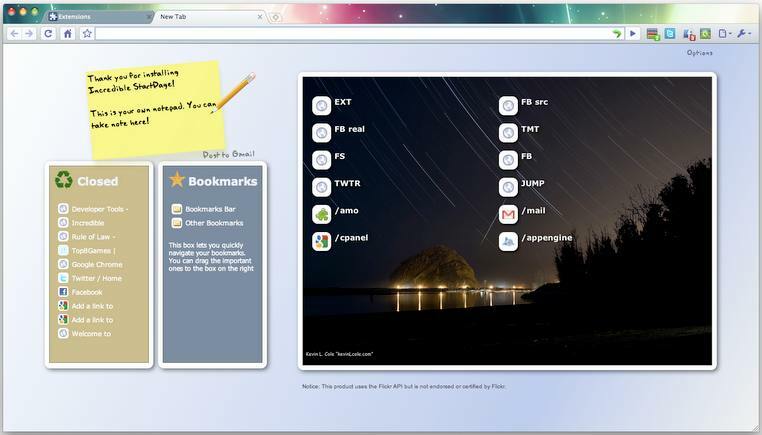 Incredible Start Page will show your bookmarks bar on left side of start page. Incredible Start Page also shows recently closed tabs, so that you can quickly open them with one click. A very interesting feature: Incredible Start Page lets you add a small note on your start page. It is like a sticky note that you can add to your start page. You can even send that note to your Gmail. Incredible Start Page is a nice to have plugin for Google Chrome. It is well designed, and easy to use. If you are a Twitter fan, then try Chrome Bird Plugin for Google Chrome.